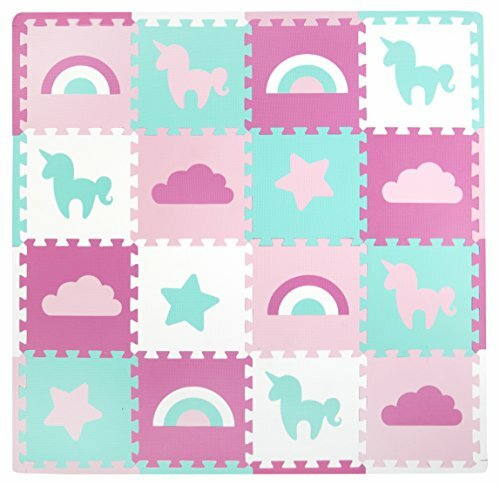 Using soft, playful foam, Tadpoles Unicorn Playmat Set provides a fun, safe environment for your little one. Made of large, interlocking foam pieces with removable shaped centers, the mats create a soft base for your child, and add a great look to any room. Includes 16 foam frame pieces, shaped center pieces, and 16 border pieces. Covers 16 square feet. Easy care and cleaning. Use multiple sets to cover larger areas. USE: Water Resistant, Durable, Lightweight and Easy to Assemble. Soft underfoot, use for anti-fatigue and sound-dampening purposes. If you have any questions about this product by Tadpoles, contact us by completing and submitting the form below. If you are looking for a specif part number, please include it with your message.